G-SERIES - are lightweight Fat Pipe sticks made of 100% fresh japanese carbon. The weight of these sticks is around very nice 200-210g. Jab - the blade is made for the best players. It is adequately concaved, the tip is little bit curved and the blade as a whole is slightly pre-curved. 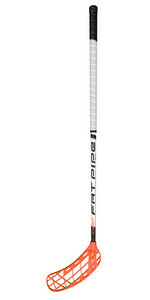 Designed for the players mostly using a sweep shot, but also a slap shot or dribling is quite nice.